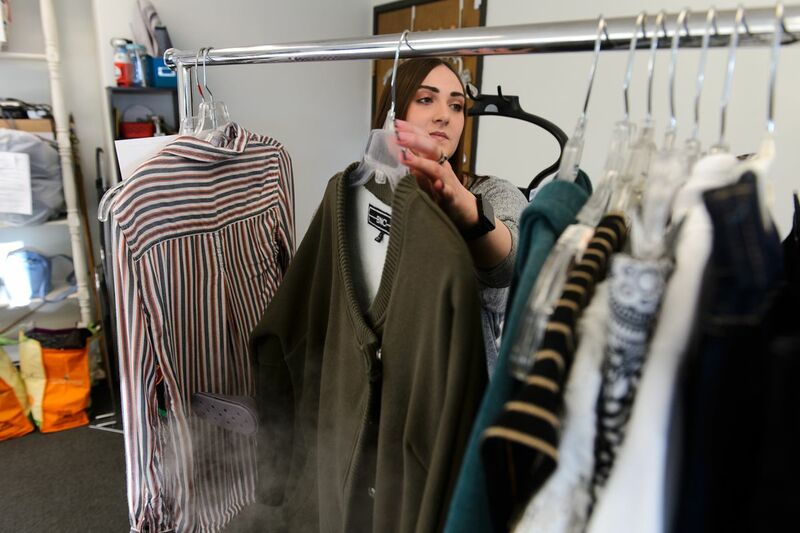 At Clothesline Consignment in Anchorage, drop-offs from people purging their closets have doubled in recent weeks. It’s the direct result, a manager there said, of a new Netflix show that has people tossing out possessions. Some of those unwanted items are ending up on the shelves at the city’s secondhand shops. “Tidying Up with Marie Kondo" debuted on the streaming service Jan. 1. Based on a book by Kondo, it showcases a methodology for decluttering — the core of which is to part with items that no longer “spark joy” in your life. It’s part of what’s called the KonMari Method. “I can tell you 100 percent that it has definitely affected us in both ways, with drop-offs and with sales,” said Clothesline manager Kortnee Ferriss. On a typical day, the store gets 20 to 25 drop-offs from people looking to get rid of clothes they don’t want, she said. But in the past couple of weeks, the shop on West Northern Lights Boulevard has seen about 40 a day. “We’ve actually had people say, ‘I was watching this show, so I’m here, I cleaned out my closet,’ ” Ferriss said. Goodwill has heard from some customers that they’ve watched Kondo’s show “and they are not only donating to our stores, but also shopping at Goodwill for home goods to help them organize their kitchens and closets,” spokeswoman Libby Steffen-Schafermeyer said in an email. Just across the street from Clothesline at Title Wave Books, where people can trade in books for cash or store credit, January is typically a busy time, owner Angela Libal said. People tend to be motivated to reorganize in the new year. While the store is seeing more books coming in, Libal can’t directly attribute it to the Netflix show. Natasha Price of Anchorage and describes herself as a bona fide thrifter. The prospect that the selection at local shops might get better in coming weeks is “kind of uplifting,” she said. Clothesline is also getting new customers as people reorganize their lives. “We’ve definitely had more people find us, too, as they get rid of stuff,” Ferriss said. At Once Upon a Child, a store for used kids' clothes and toys, business is “probably double” what it was last year during the same time, said store manager Heather Willkomm. But there are multiple reasons, she said. Part of it is likely because of the closure last year of another local resale store that focused on kids' items, and she attributed part of it to Alaska’s economy. She hasn’t heard about Kondo’s show from customers. Dana Drummond owns Hoarding Marmot, a secondhand shop for outdoor gear. He hasn’t heard from customers about Kondo’s show, he said, but there’s something else he’s noticed in recent weeks. At first he thought maybe people were desperate to sell off what they could during the partial government shutdown for extra money to make up for missed pay.